Bothies are, in my mind at least, a national treasure, capturing something of the very essence of the Scottish character and generous attitude to strangers. They are more than shelters, they provide for chance encounters of likeminded folk, to share stories (and drams) the old fashioned way, their logbooks testimony to whatever it is that drives us out of our sterile urban existences. And for the runner, they are an excellent resource for multi day trips, cutting on the amount of kit required, as well as extending the window of opportunity beyond the summer months. The Scottish north west is one of the most spectacular places I know, the Kintail area is no exception, and the Camban bothy is bang in the heart of it. 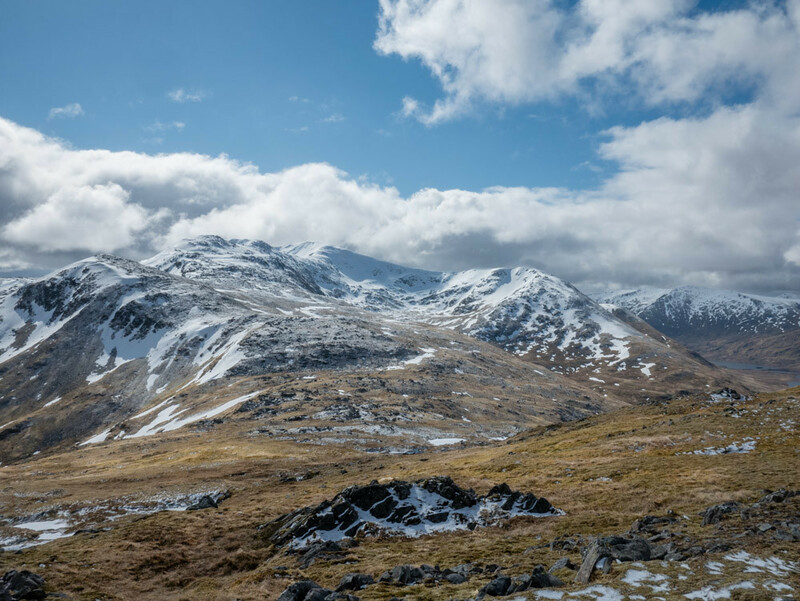 The hills and glens around it offer a genuine sense of remoteness, rare in that it persists even on the summits, for obvious signs of human activity in this area are a few. It is only when one registers the names on the map -- Kintail Forest, Inverinate Forest, Glenaffric Forest, West Benula Forest -- that the full extent to which our species has left its mark on this landscape dawns. Nevertheless, this area is a real paradise for the walker and runner alike, offering some longer ventures to both. 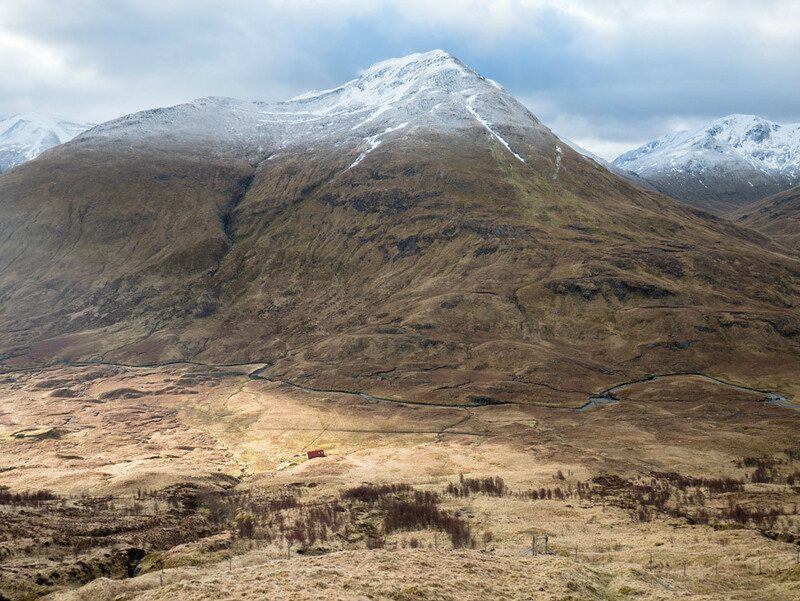 The run described here is a two day outing, taking in some of the iconic hills of this area, the awe-inspiring Falls of Glomach, and spending a night in the aforementioned Camban bothy. I should say at the outset that this is not a run for an outdoor novice; ability to navigate reliably regardless of weather is a necessary pre-requisite, as is being adequately equipped for two days and a night in these hills. At the same time multiple manageable single day outings in this area are perfectly feasible. The starting point for this trip is the tiny hamlet of Camas-Luinie. My recommendation would be to book a place in the Hiker's Bunk House for the night before your run. The bunk house is small (IIRC sleeps 6), basic but cosy, with a wood burner, well equipped kitchen, and most friendly owners. Using the bunk house solves two big problems -- there is no public space where you could leave a car, and the Camas-Luinie area is completely unsuitable for wild camping. Again, you might want to nip up An Socach, otherwise head directly down the excellent path to Alltbeithe (Youth Hostel), and from here take the path SW to Camban. While on this section in mid April this year, the weather deteriorated badly and I was forced to retreat from the high ground, taking a path W from the bealach and contouring the E side of Coire an Sgairne -- this path is excellent, an the coire is very scenic, so this might be a worthwhile alternative for getting into Bealach an Sgairne. I can also say with some authority that the short gap between the two most westerly forestry roads on the slopes of A' Mhac is not to be recommended, the ground is very steep, and there are some rusty fences and Sitka bashing involved -- it's not worth the 120m altitude saved. 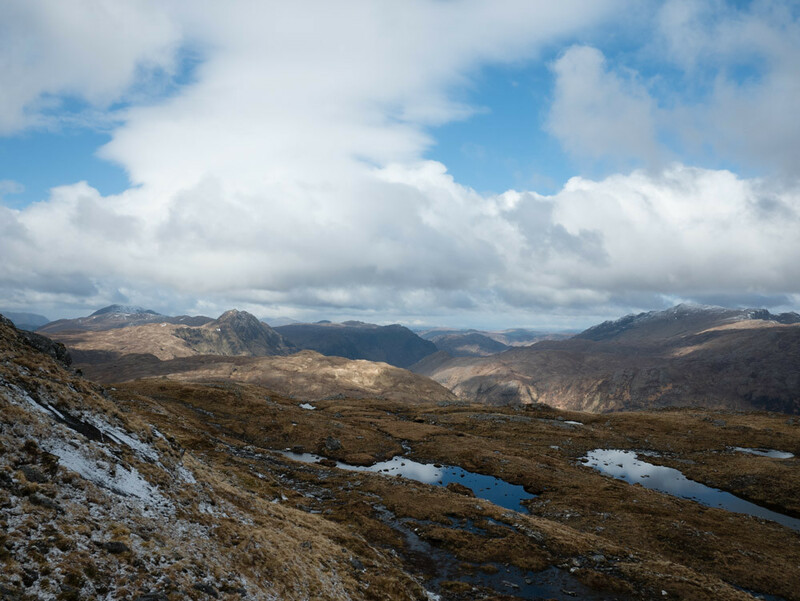 Which ever way you reach the Bealach na Sroine path, take it past the Falls of Glomach back onto the track alongside River Elchaig, and to Camas-Luinie.